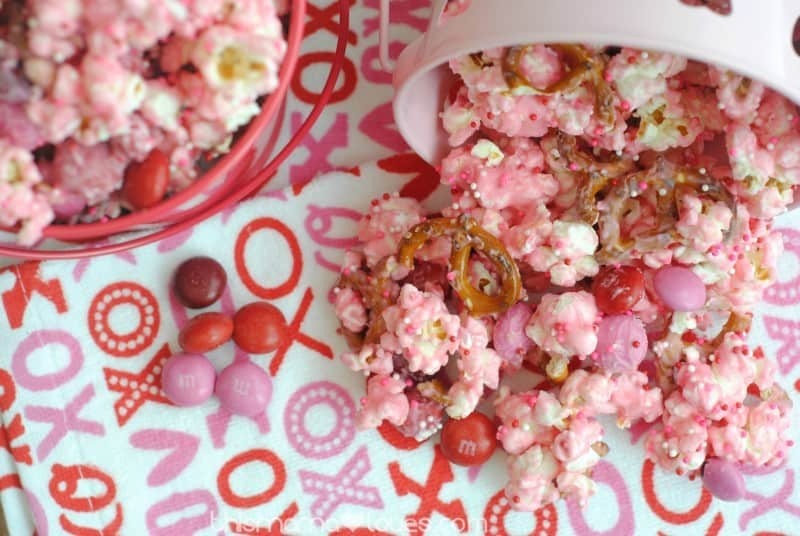 Cupid's Crunch Recipe - Valentine's Day Treats! A friend gave us a package of this delightful treat just before Christmas, and everyone in my house loved it. Christmas is over, and I did mean to share this before the holiday because it is so delicious, but we got sick and…I didn’t. 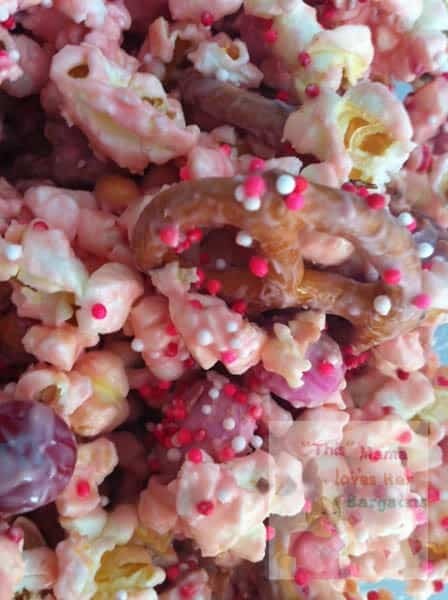 So I changed things up a little bit and came up with what I call Cupid’s Crunch (and you’ll find many variations on Pinterest or via Google search, I have) which is so easy to do and SO yummy! Pop popcorn, set aside. Be sure to pick any unpopped kernels out– they aren’t fun to bite into when you don’t expect them! Melt the candy melts at 30 second intervals in the microwave if you want this done quickly. Otherwise, you can always do a double boiler method (it’ll take longer), stirring frequently. Spread mixture out on a sheet of wax paper- drizzle remaining melted candy over the top. After the chocolate dries/firms up again, break into bits and either store in an airtight container (for about a week) or package it up into treat bags to share with friends, classmates and neighbors! If you try to do it before the chocolate is ready, you’re going to have a big mess on your hands. Of course, you can always lick your fingers. But really, it’s better to wait. I promise. The fun part of this recipe? Thanks to the candy makers all finding holidays fun for products, you can make this mix for every holiday and for no reason at all! Next Christmas we may get those holiday shaped pretzels and leave them whole, for a fully themed crunch. Want to make this a NUT FREE recipe? Use the Vermont Nut-Free Chocolate’s “Skippers” as an M&M alternative. Be sure your pretzels are nut-free as well, and voila! Nut free treat! I have spent hours online trying to find the original source for this recipe. I can’t find it. I’ve modified it, and I’m sure you will too! I was really excited to try this for my anniversary, but almost immediately after having the chocolate harden the popcorn tasted stale. Is there a way to prevent the stale taste of the popcorn? Hmm. Perhaps if you just use very little chocolate more like a drizzle? I haven’t made it in a while but now i want to to see if it tastes stale! Sounds yummy and easy to make. This would be a fun recipe to do with my boys. 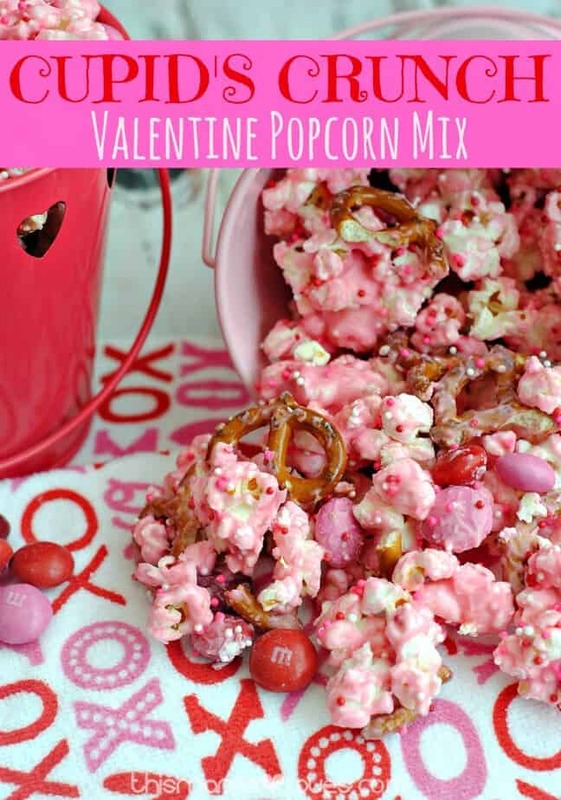 This would make such a great treat for a Valentine’s party! Thanks for linking up with Merry Monday last week! This looks great for Valentine’s Day! Thanks for sharing. I have been on the lookout for a sweet treat for my sons valentines party! Think I might have found it. Pinned! I am stopping by from ducks in a row blog hop! I love the colour that this makes, it’s so cute. I bet it would work with a nice light yellow for Easter, too, or for a baby shower. Did you use buttered popcorn? 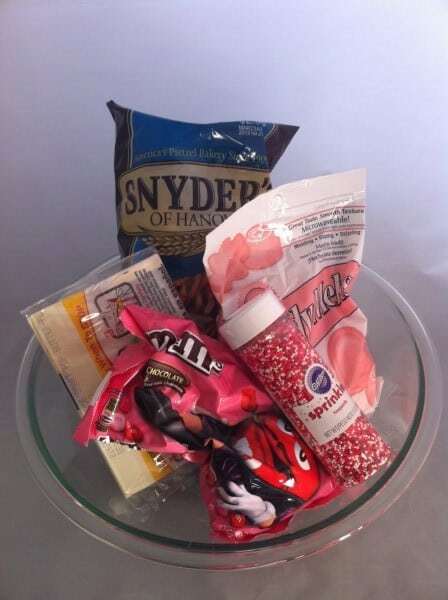 I think this Cupid’s Crunch Recipe is a grand idea for a unique valentine treat this year. So funny – I just was surfing Pinterest, adding things here and there and saw this – I laughed when I clicked the picture only to be taken to your site 😀 So fun!!! Oh, coconut would be really fun. Especially at Easter! How festive. I have to make this with the kids. Oh yum! What a great treat for Vday (or any day for that matter). I am so happy I happened upon your blog, this is an awesome idea. I usually send my daughters and my grandchildren a home made treat for Valentine’s Day, and this will be the recipe I use this year!!! Thank you! Love this recipe/mix! 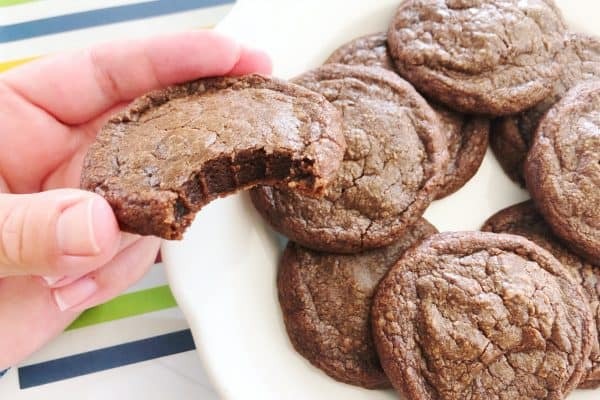 Also, for allergy free be careful of the melting chocolate…..most of the time this too is processed on the same equipment as nuts and other foods. There are certain kinds that are made that are super safe. Just got to check labels and sometimes make a call…..
Agree- you can’t be too careful. The Wilton ones I have here- I just checked- they are all “safe” that I have. You can’t be too careful though! I did similar for Christmas – even used the Captain Crunch Christmas Cereal & the Christmas pretzels (just the right size) Grands loved them. Thanks – These looks yummy and fun! I’m so going to have to try this!! Thanks for Sharing! Looks great!! Just a tip to make it safe for allergies, check your sprinkles!! A lot of sprinkles are made on equipment that processes nuts as well! I’m a teacher and have a nephew with an allergy and this came up last year in my class!! Hoe many servings does this make? I was planning to fill sandwich bags. Trying to plan how much would feed 30. Lisa I’d do a double batch for 30 people. You can easily fill 15 bags but I’m not sure you can get 30 from one! yum. 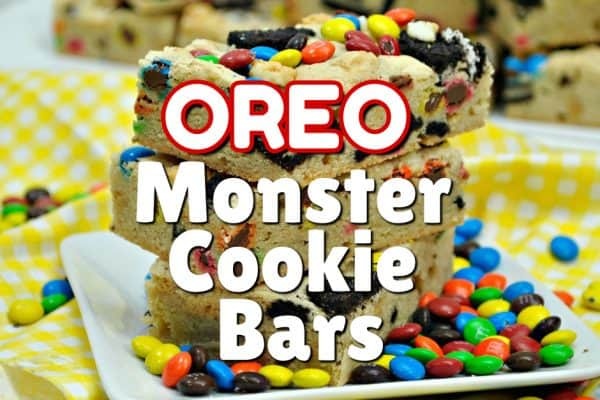 this looks good and easy to make. thank you for sharing. going to try this for sure. Oh a perfect treat. I love anything that is sweet and salty. Thanks for sharing on Whatcha Whipped Up Wednesday. Hope to see you again next week! 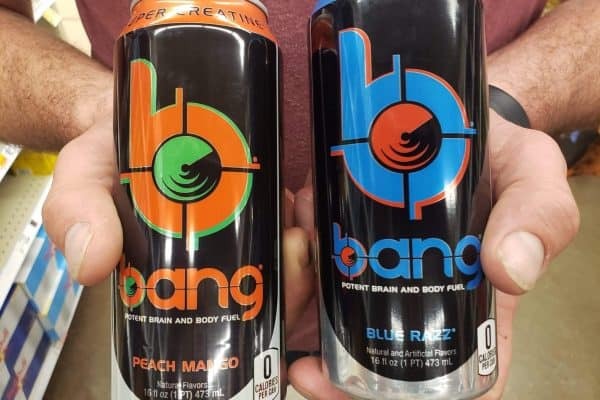 Those look good! I like how festive they are for Valentine’s Day. This looks like fun! will defiantly give this a try, V-day is just right around the corner 😉 Great Post! Thank you for the 2 rubber spatulas tip. I love changing the color for the different holidays. This looks delicious! Can’t wait to make for family. Thanks for sharing recipe. Those look yummy! I like it’s snackin’ size. YUM! That looks good, I love snacking on things like this! This looks great and the variations for the holidays like St. Patrick’s Day and Easter are endless! OOOH! I love this! Anything pink catches my eye immediately. I think this will be our Valentine’s Day snack! Thanks for sharing such a cute recipe and idea! This sounds fun and delicious I will have to make some. Looks good. The pink candy makes it festive.